Ten vibrocores were collected from the outer, middle and inner part of the tidal flats off Busum (German North Sea coast) to identify the gradual changes in sediment composition and sedimentary structures due to their location and input of hydrodynamic energy. The outer part of the investigation transect includes Tertiussand and D-Steert, the middle part is the huge sandbank of the Bielhovensand and the inner part comprises the Meldorf bight. 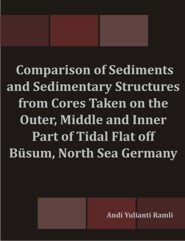 The study turned out that the facies in the outer part is dominated by sandy material and the bedding types mainly are small scale cross bedding and massive sand. The facies of the middle part is characterized by a mixing of sandy and muddy material which results predominately in flaser bedding. The sediments of the inner part are characterized by silt and clay rich (muddy) materials with minor fine sandy components. Lenticular bedding is the typical bedding structure. From grain size analysis of the sand fraction, a distinctable grain size gradation from the outer part towards the inner part is clearly seen. In the outer part, the mean of mean grain sizes ranges between 2.9 Phi and 3.06 Phi. The average values slightly decrease in the middle part where they range between 3.12 Phi and 3.17 Phi. The finest grain sizes are found in the inner part with ranges from 3.5 Phi to 3.6 Phi. Even though the mean size and the standard deviation are independent values, they show a tendency that as the value of mean of mean grain size increases, the mean of standard deviation decreases. The mean of standard deviation on the outer part ranges between 0.36 and 0.43. On the middle part, mean of standard deviation ranges between 0.37 and 0.42. The inner part shows values of mean of standard deviation between 0.31 and 0.5. Increasing percentages of silt and clay here called mud can be identified from the outer part towards the inner part. In the westerly most seaward areas the mud content is normally low in the range of just a few percent with some rare exceptions of up to 36%. In the middle part the mud content ranges between 1.42% and 28.67%. The highest percentages of mud were found in the inner part of Meldorf Bight, where they range between 14.24% and 43.85%.